Looking for a good read? 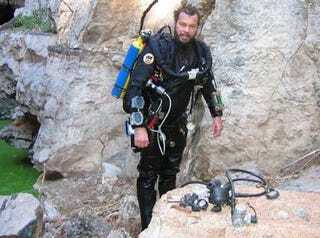 This oldie-but-goodie from Outside magazine tells the story of Dave Shaw, a deep-water diver who swam more than 800 feet down into a freshwater cave to retrieve the body of a fallen diver. And he didn't use just any scuba gear, either. He used a self-assembled closed-circuit rebreather set that actively filtered his own breath and turned it back into breathable air. With no tanks to carry, it allowed him to stay underwater for the required 12+ hours it took for him to slowly return to the surface without getting the bends.